It's likely that Girl Scout founder Juliette Gordon Low would approve of her organization's recent plunge into viral marketing. After all, Low used the then-newfangled telephone almost a century ago to declare her intention to start the Girl Scouts to a friend.Like technology, cookie sales have been part of the organization since its early years. It's a lucrative tradition: The cookies, including Thin Mints and Samoas, bring in $700 million in sales a year. But cookie sales slipped about 1% last year, prompting the organization to look for new ways to get its message across to potential cookie buyers. The result? The Girl Scouts posted a video on YouTube called "What can a cookie do?," which has attracted about 24,000 hits since it was posted Jan. 19. "We're anxious to see how it works because it lets us get our message out in a cost-effective way," Laurel Richie, chief marketing officer of the Girl Scouts of the USA, says. She also hopes the video will help engender trust among those viewing the ad. "There's a greater engagement when a video is passed onto you, because it has the implicit endorsement of the person who passes it on," Richie says. The video focuses the connection between cookie purchases and how the girls use the funds to help their communities, learn business skills and build self-confidence. Its point: "Every cookie has a mission: to help girls do great things." While the video aims to get viewers to understand the philosophy behind cookie sales, it also directs viewers to a website where they can find a place to buy the treats. (In full disclosure, I am an assistant leader of a Girl Scout Daisy troop and I have placed a cookie order this year.) Richie says she's "cautiously optimistic" that the video will have a positive impact on sales. For now, it's too early to tell. Like cookie sales, membership in the Girl Scouts has also slipped in recent years, Richie says. "We're in the middle of rebuilding. We had a membership spike in 2002 and didn't have the sustainability to get it going," she says. "We're hoping we'll be more efficient to not only get new members but retain them." In 2004, the organization started developing a new business strategy to help it become more relevant to girls and their families. Volunteering opportunities, for example, had stemmed from the post-World War II days when most mothers stayed at home. So the organization revamped, offering flexible opportunities for parental involvement as well as online orientation. To make the organization more efficient, the number of Girl Scout councils, or local offices, was whittled from 312 to 112. Social and viral marketing is the next step in the process. Still, there's been growth in one quarter: Richie says the organization has seen a spike in interest from Hispanic families, with a 33% jump in Hispanic members during the past six years. "We're looking at almost every non-traditional way to get the word out," Richie adds. 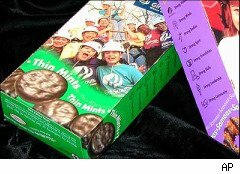 Northern California Girl Scouts, for example, are also using text messaging, phone banks and Facebook to sell cookies this year, according to the Contra Costa Times. For the Girl Scouts, tapping social marketing may just be the way to whip up a lot of dough.